Just one of the many things I've had enough of: Calvary. Sunday morning was Easter, the day around which the Christian year revolves. In the ancient church, every Sunday was supposed to be a little Easter, and Easter itself was, well, the big Easter. Most churches have allowed the Easter to seep out of the other 51 Sundays, but all of them still make a big deal about the Sunday that is above all other Sundays. Anyway, I went to church on Sunday, as I have every Easter Sunday of my entire life. I went to sit with my recently widowed mother because, quite understandably, it wasn't easy for her to be their by herself. My father (as you know already if you've spent any time at all reading my previous posts) was a United Methodist minister, so being in church without him was a hard thing for her. For my part, I'm a former minister myself. I've also been a church musician for more years than I was a minister. When I wasn't preaching, conducting, or playing, I still went to church to be with my faith community on this day of celebration. It was wonderful seeing more faces than are usually in church, many of them unfamiliar, or only present once or twice a year. Everything about the service is bigger and better than usual: the choir performs extra music, the bell choir makes an appearance, their are often brass instruments, and the organist literally pulls out all the stops. The hymns are brighter and more lustily sung. The sermon is about the most reassuring message in the Christian canon: resurrection. All this was true at Lake Oswego UMC, where I was Sunday morning. And I was so glad when it was over. Now here's the part where I'm going to rattle some Christian cages. I apologize in advance; but then, nobody's forcing you to read this, so stop you're bellyaching. The first reason I've had my fill of church, especially on Easter, is--and I know this will sound like heresy to my fellow church musicians--so much of the music is simply, sadly, irredeemably bad. This was true of the choir's "Easter Fanfare" anthem Sunday morning, a bit of pompous dreck I may well have performed with one of my church choirs at some point in the past. I remember visiting Sheet Music Service of Portland to rummage through anthems, trying to find usable music for my choir, and rejecting one after another for using the same tired tropes: modulating up for the final verse, chord progressions using flatted seven and three chords, quoting a familiar hymn tune to make a new setting of the text more palatable, schmaltzandos tailor made to wrench sentiment from the hearts of every older member of the congregation, soft-rock gimmicks to tweak the boomers (and I'm sure the indie equivalents are now appearing for the sake of millennials), and on and on and on. I could spend an entire day at that store, and leave with maybe a half dozen anthems. On no Sunday are all these cliches more obvious than on Easter, but I've heard them on many other Sundays, in many other places, and conducted or accompanied plenty of them. A quick disclaimer, because it needs to be said: much of the most beautiful music ever written is church music. Some of this sublime stuff is even being written now. Unfortunately, what congregations want, and successful music directors deliver, tends to err on the side of sentiment. Now for the second reason I'm done with church, something I expect will alienate another drove of former colleagues: preaching. There was a time when preaching was my favorite part of ministry. My sermons were performance art pieces. I preached without a manuscript from my first formal homiletics class. I'd seen both styles, and there was no question that manuscript-free sermons were far more powerful. At first, I wrote complete texts, reviewed them up at every moment I could until it was time to step forward, then left the manuscript under my chair, stood up, and preached from my heart, with help from my head. Over time, I became more comfortable with improvisation until, toward the end of my career, I stopped writing entirely. I preached mostly in stories--"narrative preaching" is the official term--but even when I was working closely with the text, exegeting it from the pulpit, I did it extemporaneously. Preaching like this can compensate for all sorts of pastoral failings. People simply love to see and hear a preacher step out of the pulpit and go off book (to borrow a theater improv term). It makes the sermon seem far more personal, informal, relational. Even fellow preachers are impressed by preacher who can deliver a sermon sans manuscript effectively. Unfortunately, having been such a preacher makes me a lousy congregant. I heard a competently delivered sermon Sunday morning, one that any preacher in any Methodist church could have felt good about having preached. The minister went off-book a few times, but mostly stuck to his manuscript. And because of that, he lost me. There were other things about the sermon that didn't work for me, but mostly, it was the delivery that left me cold. (Those other things will figure into the third reason I'm done with church, by the way.) Sadly, being a narrative preacher means I've been ruined for ever enjoying a manuscript sermon again. I just can't silence the inner critic. The third reason I'm done with church is the riskiest one, though there'll be nothing new here for anyone who's followed this blog for any length of time: Easter is, I'm sorry to say, theologically bankrupt; and because the entire Christian year is built around Easter, that means Christianity itself has a hollow core. Leonard Bernstein's Mass summed it up well in the "Credo," the part of the mass where the church declares what it believes. One of the singers in Bernstein's version sings "You had a choice to die and then become a God again. Well, I'm not gonna buy it!" (Bernstein's Mass is something of an angry gay Jewish rant against much that the church believes, and yet full of gorgeous, foot-tapping music, some of it quite spiritually inspiring.) The Resurrection of Jesus is a cosmic cop-out. It's the deus ex machina to beat all dei ex machinae (and I'm sure I mangled that bit of Latin, but hey, I only know the stuff that's in the mass, so sue me), the sort of thing that renders 99% of what comes out of Hollywood a lie (the works of Joss Whedon being a notable exception), that sets us up to expect, in fact, that no heroic death need be feared, because some higher power will always bring back a beloved character who dies sacrificially. Death is not the price of Christ's witness, not truly, because he is brought back. Yes, his suffering on the one day before he dies is hard to listen to, but considering the United States has held some Iraqi and Afghani citizens prisoner for a decade and a half, and some of them were subjected to water boarding hundreds of time, a single scourging, a painful parade to Calvary, and a few hours on the cross are par for the atrocities course. Oh, he has to spend a couple of days in the ground, but really, the suffering of Jesus, pounded into the heads of confirmands for two thousand years, is a short term ordeal voided by the happy ending. I remember a Scoutmaster delivering a Sunday devotion during a campout where he said that all the great founders of all the world's religions had graves that could be visited except one, Jesus, because he was resurrected. I think he's wrong on his initial claim, expect he didn't really understand how some of those other religions operate, and have to note that, in fact, the church does claim to know where Jesus's grave is, and has in fact built a church over that very spot. Christianity has made the death and resurrection of Jesus into its sine qua non. The teachings of Jesus--arguably, if one takes the gospels seriously, what he himself believed his ministry was all about--are dwarfed by the church's emphasis on the atonement, on Jesus dying to take away our sins, then being resurrected so that we can live again. The church year is one long cycle of guilt and redemption, and because of the emphasis on grace, it rarely--bigoted prohibitions of certain "sins" like homosexuality aside--has much to say about right living. I would have these theological criticisms at hand for any church service, but they are heightened to an extreme on Easter. Holy Week is a time for wallowing in the suffering of Jesus. After a week of unrelenting guilt, Easter is the great "never mind" that makes it all worthwhile. Of course, as I noted earlier, sanctuaries are fuller on Easter than on any other Sunday, and few, if any, of those coming for this one Sunday a year have been present for any of the garment-rending breast-beating anguish of the week that leads up to it. That's like coming to dinner and being served nothing but dessert--and lots of it. Apart from the sentiment oozing from most of the music and, often, the children's message and sermon, sanctuaries on Easter are frequently decorated with lilies--not necessarily a bad thing--and, in many churches, a flowering cross. Of all the modern church symbols that turn me off, nothing comes close to the flowering cross. It starts out as a plain wooden cross covered in chicken wire. A procession of children and, sometimes, adults brings forward cut flowers to insert in the chicken wire until the cross is smothered in beauty. I expect the symbolism is supposed to be that of new life from death, but all I see is a prettified torture device. It reminds me of a preacher I heard in the 1980s who claimed that, unlike Catholics, who put an occupied crucifix front and center, Protestants use an empty cross to celebrate the resurrection, rather than the death, of Jesus. It's as if Jesus was plucked from the cross by God and brought back to life on the spot. In fact, the cross is an ugly reminder that Jesus was executed. The tradition that he lay in the grave for at least two nights and a day (it depends on the gospel you're reading, as well as how you interpret the "after three days" prophecy Jesus himself makes) is there to underline the fact that he was really, truly dead. The creeds emphasize this even more by saying he "descended to hell." 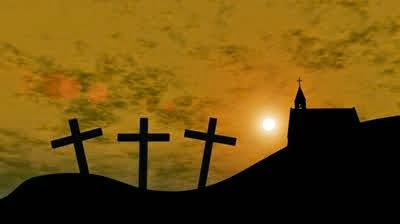 The cross represents death, not resurrection, whether or not it has a body attached to it. 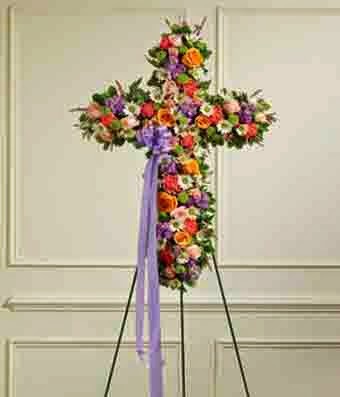 Covering it in flowers conceals its essential brutality, and furthers the misconception that Christians escape death. I first encountered the tradition of the flowering cross in the late 1980s, and was appalled by it then. I've been fortunate not to be around too many churches that practiced it. When I have, I've heard many crow with delight at how beautiful the cross is, posing their children with it for pictures after the service. I always have to wonder: what if Jesus had been hanged by the neck, beheaded, electrocuted? Would you be posing your children with a flowering noose, headman's axe, electric chair? I'm glad this is one tradition that Lake Oswego did not practice, but whether or not it has ever made an appearance there, the theology running rampant in that sanctuary, as in most sanctuaries last Sunday, was of the triumphal resurrection of Jesus and, through him, of all who follow him. I know this belief gives many comfort, hope, reassurance in times of grief and suffering. I don't wish to take that from them. I just have to admit that, after all these Easters, it doesn't work for me anymore, and hasn't for many years. That's why, on any given Sunday that I'm not otherwise committed or in some way rendered physically incapable, you'll find me somewhere else. I plan to live a long, healthy life, doing all I can to make the world around me a better place, and that starts with keeping myself in condition, physically, intellectually, and spiritually. Church is no longer a place where I can do any of that work. So don't look for me there. Try a trail, a bike path, or a gym. That's where I'll be sweating out my frustrations, letting go of my failures, and transcending my limitations, experiencing the little resurrections that mean much more to me than the one big symbolic one. Awww... this one makes me kind of sad. But I agree with you on Easter anthems; I've always said if you've heard one you've heard them all. A lot of what annoys you here is style rather than substance. And trails, bike paths, and gyms are not mutually exclusive with churches (or 2 or 3 gathered together).